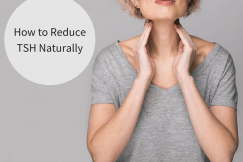 Thyroid disease is becoming a major health issue in the U.S. Did you know that 20 million Americans have been diagnosed with some form of thyroid disease? 14 million of those have been diagnosed with Hashimoto’s disease. When I first read these stats, I was shocked. We need to raise awareness and help others get to the root of their health issues so we can turn this trend around! 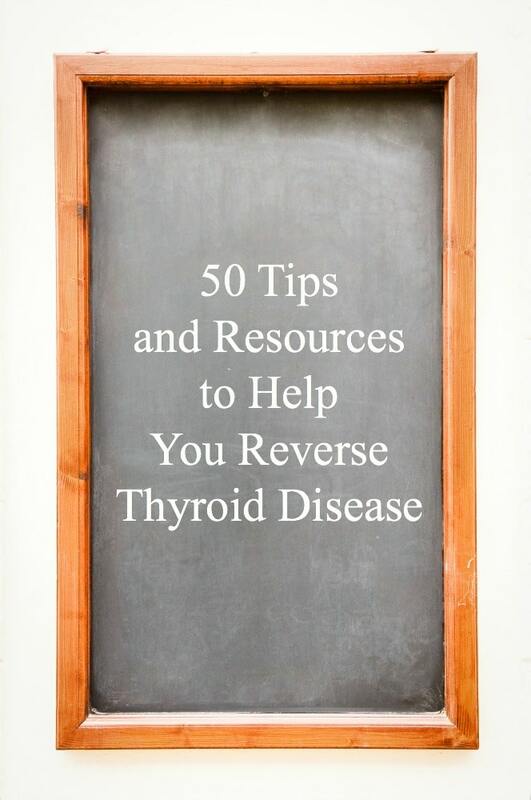 Today, I’ve got a list of 50 tips and resources to help you to reverse thyroid disease. January is Thyroid Awareness Month, so I wanted to write a post today to help point you, your friends and family members in the right direction. These are many of the steps and resources I used to help me while I worked to reverse Hashimoto’s disease. If the list is overwhelming, think about finding just one change or resource each week. After about 6 months, you’ll have made a wealth of changes and will hopefully be on your way to better health. 1. 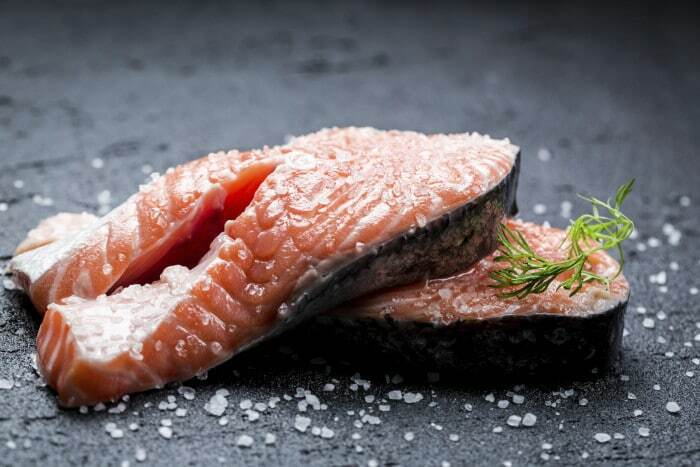 Eat a diet rich in omega-3s – Omega-3s help reduce inflammation and strengthen the immune system. Your ratio of omega-3 to omega-6 intake should be between 2:1 and 1:1 to maintain a healthy immune system and reduce inflammation. You can find omega-3s in foods like grass-fed butter, pastured/organic meats (beef, chicken, duck, lamb, etc. ), wild fish (not farmed), organic eggs, unprocessed/pastured milk and cream, ghee and duck fat. 2. Cook goitrogenic vegetables before eating – Kale, bok choy, broccoli, Brussels sprouts, cabbage, cauliflower, turnips, and mustard greens should be cooked before eating because when eaten raw they can suppress thyroid function. 3. Drop the gluten and grains – When grains enter the body, they cause the insulin levels in the blood to rise. When they are eaten in excess over time, the body becomes overtaxed, and eventually the excessive grains can cause inflammation. Inflammation is the root cause of autoimmune disease. A grain-free diet rich in nourishing foods gives the body time to rest, heal and reduce inflammation. 4. Take fermented cod liver oil daily – Cod liver oil can help reduce inflammation and provide necessary Vitamin A and D to help your body detox. 5. Castor Oil Packs – Castor oil packs can be used for thyroid nodules, cysts, liver detox, to increase T4 to T3 conversion, and so much more. Here’s a post I wrote on the topic along with instructions to get started. 6. Exercise, but not too much – If you’re struggling with thyroid disease, you’re probably also dealing with inflammation. Strenuous exercise can induce inflammation, so it’s better to stick with yoga, pilates, walking, light weightlifting, etc. 7. Get in the sun without sunscreen – Sunlight can help reduce inflammation and nourish the thyroid. 8. Eat seafood and sea vegetables – The iodine in the seafood and sea vegetables can help nourish the thyroid. 9. Read the book, Hashimoto’s Thyroiditis: Lifestyle Interventions for Finding and Treating the Root Cause – Dr. Wentz discusses how to find your root cause of your disease and how to treat it. 10. 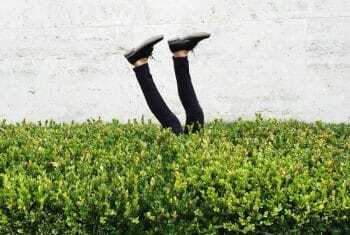 Test more than just your TSH level – A “normal” TSH doesn’t really mean much. Why? Because TSH measures a specific output of the pituitary gland and thyroid disease is way more complicated than that. Here’s a list of labs to talk with your doctor about: Free T3, Free T4, Reverse T3, Vitamin D3, anti-TPO, TgAb, Adrenal Cortisol levels, MTHFR gene, B-12, and Folate. Or, if you’d like, you can make a Nutritional appointment with me at Biodynamic Wellness: 858.259.6000 – I work with all clients long-distance! 12. Read This Article and take some easy steps to improve your thyroid hormone conversion – If you’re making enough T4 but not enough T3 this article will be super helpful for you! 13. Drink Bone Broth – It’s easy, it’s cheap and it contains a wealth of nutrients to help reduce inflammation. Here’s some more info on this topic. 14. Remove ALL processed foods from your diet – Eat traditionally prepared, real foods – foods free of pesticides, herbicides, and all chemicals are ideal. I know this may sound extreme, but to give the body time to rest and heal, nourish it with the right foods. I’ve walked down this path and, yes, it can be frustrating at times, but after seeing how foods can heal, I would certainly do it all again. If you need help with this, I have hundreds of recipes on my blog and also over 125 grain-free, nutrient-dense recipes in my new cookbook – The Grain-Free Family Table. If you own my first cookbook, Deliciously Organic, click here to download the grain-free adaptations for free. 15. Don’t eat soy (except for traditionally fermented soy like Nama Shoyu) – Soy can be an endocrine disruptor and suppress thyroid function so it’s best to avoid all processed soy. 16. Try dry brushing – Dry brushing is easy, only takes about 1 minute to complete, and can help drain the lymphatic system. 17. Eat pastured, grass-fed, organic animal foods – Foods derived from animals raised 100% on pasture (and wild animals) are anti-inflammatory. 18. Add grass-fed gelatin to your diet – Gelatin has also been shown to benefit the digestive tract, immune system, heart, liver, muscles, and skin. It also helps aid in detoxification. 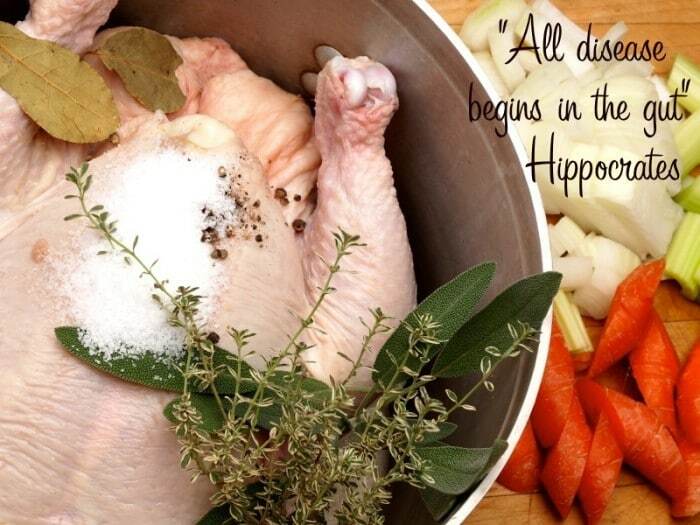 It’s odorless and flavorless so it can be added to any type of dish. It’s important to purchase from the right source, though. Bernard Jensen and Great Lakes gelatins both come from grass-fed animals and don’t contain MSG (most other brands of gelatin contain MSG). 19. 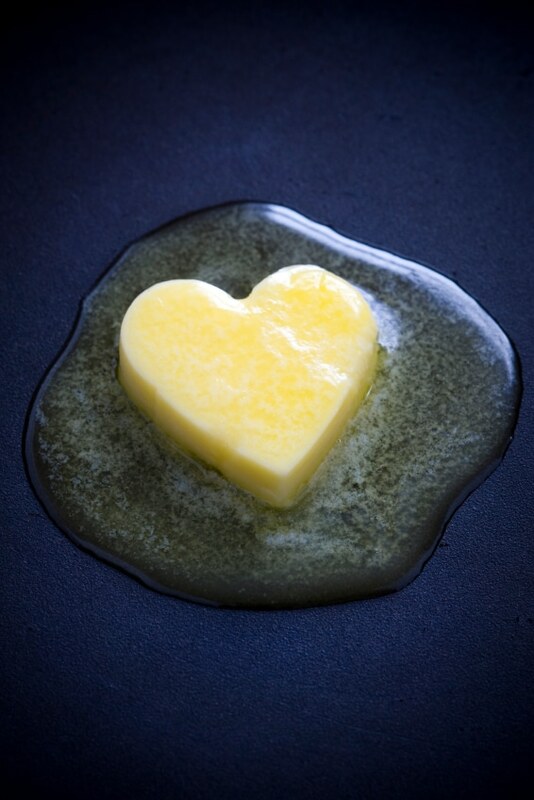 Eat saturated fats at every meal – I could go on for days about the many benefits of saturated fats from the right sources: organic butter, coconut oil, ghee, lard, tallow, etc. In a nutshell, they help reduce inflammation and nourish the body. Here’s a fantastic resource with dozens of peer-reviewed studies demonstrating the health benefits of saturated fats. 20. Use healthy cookware and bakeware – Most of us spend lots of time addressing the foods we eat but very little time thinking about the pots and pans we cook and bake them in. Take a look at your cookware and bakeware – make sure it doesn’t contain metals or chemicals that might leach into your food. 21. Make sure you get enough vitamin D – Vitamin D deficiency has been linked to numerous autoimmune disorders so it’s important to know your vitamin D levels and make sure you’re getting enough. 22. Make sure your stomach is producing enough acid so your body can break down and ulitilize the nutrients in your food – If you struggle with heartburn, bloating, or any kind of indigestion, these are classic signs of low stomach acid. In this article I give a step-by-step plan to increasing stomach acid. 23. Eat fermented foods – Fermented foods like sauerkraut and kimchi contain millions of healthy probiotics. They’re easy to make at home, too. I consume 1-2 tablespoons at each meal. 24. Take probiotics – 80% of the immune system resides in the gut, so a good probiotic can help aid the immune system. Here’s one of my favorite brands. 25. Anytime you take a prescription drug, over-the-counter drug or get a vaccine, read the insert and know the ingredients you’re putting into your body – You might find gluten, egg, soy, bovine cells, pig cells, human cells, heavy metals, etc. used in these products. Depending on your condition, you might consider other alternatives. 26. De-stress – I’ve never been good at this one, but I’ve learned the hard way that it’s really ultra-important – Stress can cause your thyroid to perform at a sub-optimum level. Do what you need to do to relieve the stress in your life. 27. Read This Article 20 Steps to Heal From Adrenal Fatigue – 90% of those who struggle with thyroid disease also have some form of adrenal fatigue. The info in this article can be lifechanging! Each in-depth article will help you figure out the labs you should get and their optimum levels, common symptoms, root causes, and the first steps you can take to reverse your disease. 29. 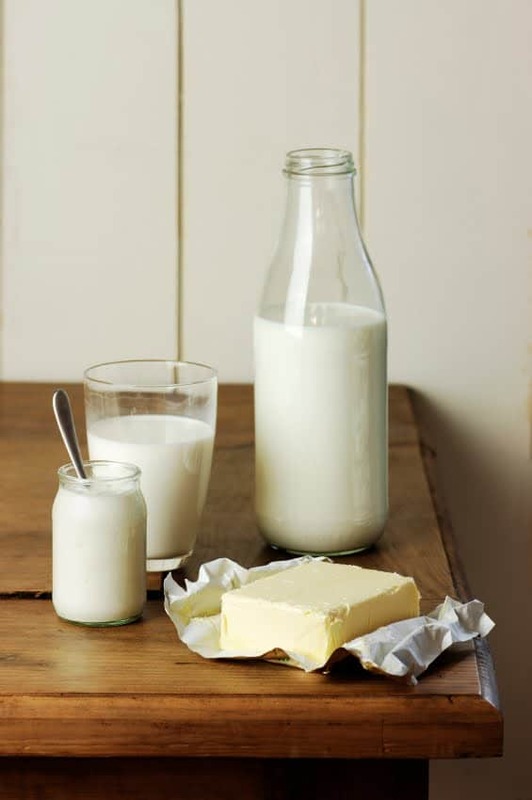 If you can tolerate dairy, consume unprocessed/raw, pastured dairy – Unprocessed or raw dairy can provide a wealth of nutrients and help reduce inflammation. I never needed to give up raw dairy during my recovery and I found it a helpful source of omega-3, Vitamin A, Vitamin D, and Vitamin B. 30. Detox your skin and body care products – Read the ingredients and cut out products containing synthetic chemicals and other ingredients that could be harmful to your thyroid. The substances we put on our skin can get into the bloodstream, so the lotion or lipstick you use every day could be causing a negative effect on your system. Here’s a list of the skincare products we use in our home. 31. Reduce your caffeine consumption – Caffeine can cause stress on the adrenal glands which can in turn cause stress on the thyroid. It’s a good idea to decrease your coffee consumption, enjoying it only occasionally. 32. Use unprocessed Celtic sea salt daily – Conventional salt is a processed food that usually contains anti-caking agents and dextrose (a sugar derived from corn) gets bleached. An unprocessed salt, like Celtic Sea Salt provides about 80 different minerals for the body. 33. Take steps to gently detox your liver – Your liver performs over 500 different functions including converting T4 to T3. It also helps keep your blood sugar levels in balance which is very important for reducing inflammation and hormone balance. 34. 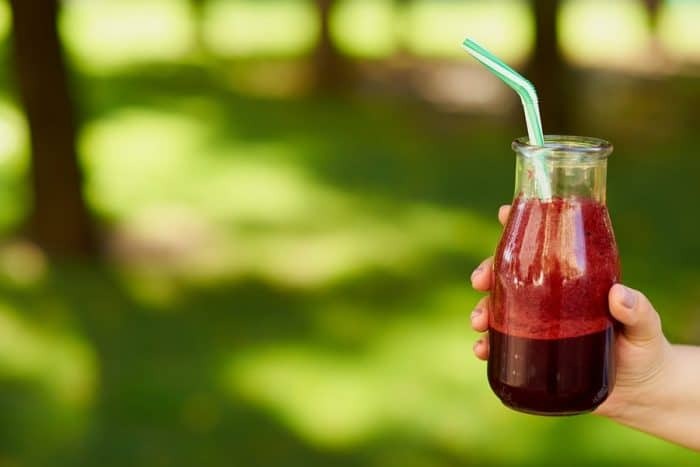 Consider having your amalgam fillings removed – Amalgam fillings can cause inflammation in the system as they continue to off-gas each time you eat or drink. If you get them removed, it’s imperative you go to a dentist who is trained to remove them safely (I learned this the hard way). If you have them removed, follow the advice of your dentist and also follow up with a heavy metal detox protocol. My favorite is The 5-Day Dental Detox written by Dr. Louisa Williams. 35. Get genetic testing – I got genetic testing done at 23&Me and then had it analyzed by a professional who is trained in this area of study. The results opened up a whole world of answers for me! It was truly invaluable to learn about my gene mutations and how I can aid my body to methalate more efficiently. 36. Watch The Thyroid Summit – Dr. Cohen brought together some of the leading experts on thyroid disease to help you gain access to the information you need to optimize thyroid function and stop suffering. 37. 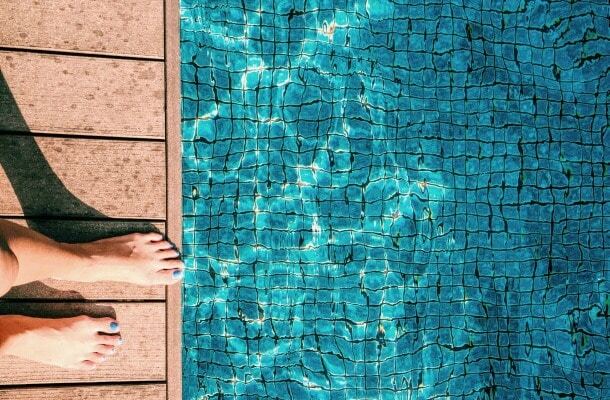 Stay away from chlorine, fluoride and bromine found in tap water, swimming pools, bathing water and baked goods – Chlorine, fluorine, bromine and iodine are all halogens. Unfortunately, chlorine, fluorine and bromine are similar enough to iodine that they can be absorbed by the thyroid in place of iodine and “displace” the iodine. 38. Make sure you’re getting enough B vitamins – One of my favorite supplements is made by Thorne. 39. Eat iodine-rich foods daily or take an iodine supplement – Iodine is very important for the production of thyroid hormones. 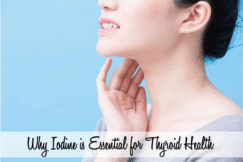 Read this article that explains why iodine is important for those struggling with thyroid disease (even Hashimoto’s!). 40. Remove all sugar from your diet – Sugars can cause inflammation in the body, so it’s a good idea to remove them from your diet to give your body more resources for rest and healing. If you struggle with sugar cravings, make these buttermints and follow the directions listed in the article. They really work! 41. 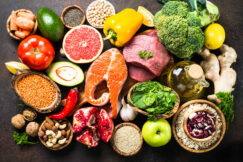 Make sure you’re getting enough carbohydrates – Sometimes when eating a grain-free diet, you can get too few carbohydrates to fuel the adrenals and other organs of the body. Try various quantities of carbs to find the right balance for your body. 42. Get LOTS of Vitamin A from animal sources in your diet to enable your thyroid to function properly – It’s a huge misconception that vitamin A can be found in plants. Vitamin A is only found in animal foods. You can get this vitamin by eating animal foods such as grass-fed beef, pastured chicken, pastured eggs, organic butter, organic lard, wild game, etc. 43. 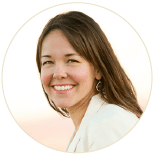 Take my free online class – In this class you’ll learn how to use essential oils to support your thyroid, adrenals, liver, to get a good night’s sleep, and much, much more! 44. Use coconut oil in your cooking and baking – Coconut oil can help reduce inflammation which will in turn help thyroid health. 45. 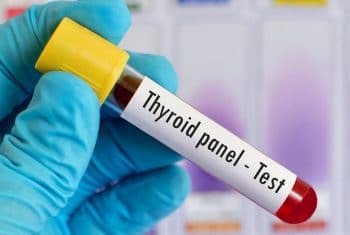 Read this article by the Weston Price Foundation – It discusses alternatives to medicine for treating thyroid problems, the tests necessary to establish the health of the thyroid and the different types of Hypothyroidism. 46. Read the book, Why Do I Still Have Thyroid Symptoms? When My Lab Tests Are Normal? : A revolutionary breakthrough in understanding Hashimoto’s disease and hypothyroidism” by Dr. Datis Kharrazian – Through exhaustive research and clinical experience, Dr. Kharrazian has discovered what really causes hypothyroidism and how to manage it. 47. Read the book, Deep Nutrition by Dr. Cate Shanahan – This book helped me understand how imperative a nutrient-dense diet is for our health. It’s a must read! 48. 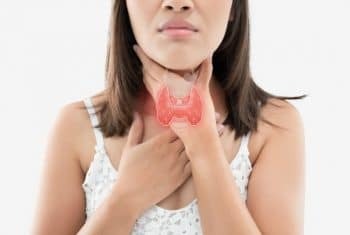 Find your root cause – Hashimoto’s is a thyroid autoimmune disease, but the reason why the immune system is attacking the thyroid may be different for each person. 49. Get at least 8 hours of sleep – The body repairs, heals, detoxes, etc. while you sleep, so it’s important to get enough to help your body rest and do its job. If you’re struggling with insomnia, click here to read my 10 tips for a good night’s sleep. 50. 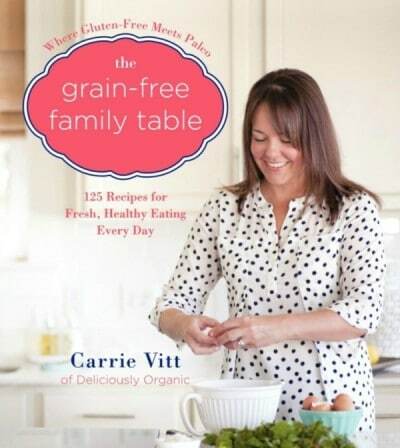 Read The Grain-Free Family Table – I wrote this book after reversing Hashimoto’s disease using a grain-free, nutrient-dense diet. It contains recipes, resources, and encouragement for your journey. Many of you have written to tell me about your recovery from thyroid problems. What are your best tips and resources? Please share so we can all learn from one another! Thank you so much for this post, Carrie! It is very informative & helpful to have all the information in one place :) Greatly appreciated & pinned on Pinterest! VERY helpful post, Carrie! I have recently done the 23andMe testing and LiveWello interpretation, but my doctor and I are having trouble understanding my MTHFR and methylation status. How did you find a genetic counselor who understands this? Carrie, thank you SO much for this post. It's so helpful and provides a lot of resources and encouragement! Keep up the good work! After years of blindly plodding along on hormone pills and thyroid meds, I too was forced to accept the symptoms of deeper, more complex root issues in my health. Many of these resources have been a great help to me as I've reevaluated what I once believed about the thyroid and my overall health...and it's exciting to finally see progress toward true healing as a result!Thank you for always sharing so openly about your personal story and for making resources like this available to help others. This is like a one stop shop for thyroid health resources - definitely sharing! Carrie, thank you for this very informative article. So well written with so much information to continue the research if needed. I was diagnosed with Hashimoto's about six years ago. The book I Quit Sugar by Sarah Wilson, along with Sarah's blog and the I Quit Sugar blog, have helped me so much. I try to keep my sugar consumption to six teaspoons a day or less. While I don't totally abstain from eating gluten, I have overcome fatigue and my thyroid-related weight gain.I'm curious about how you define or explain the word "reverse." Thanks for the list! I'm glad you've found Sarah Wilson's book helpful. She's got some great advice! I think many interpret the word "reverse" differently. Some think of it as all symptoms going away, but I personally think of it as all symptoms going away and labs returning back to normal. Of course, each person's root cause is different, so the road to remission will look different for each person. Hi Carrie.My problem is an overactive thyroid (hyperthyroid). There doesn't appear to be much help with this. There is a lot of help for people with hypothyroid which is the more common complaint.Every article I read about is for an underactive thyroid. Yes! These tips are for anyone with any form of thyroid disease. When I was struggling with Hashimoto's I swung back and forth between hyperthyroidism and hypo, until I was able to balance everything out (my root cause of heavy metal poisoning, so when I got rid of the heavy metals and reduced the inflammation, all of my symptoms went away and labs returned to normal). Hope that helps! Thanks Carrie, this is a great site. Ok, thank you very much! Also, thank you for all this research. I have The same question, mainly as hyperthyroid is opposite to hypothyroid. 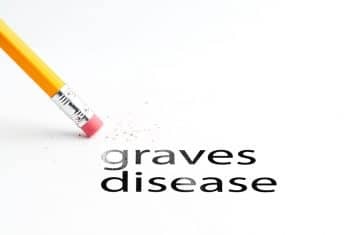 Is this the better way to deal with Graves’ disease? A little concerned as it seems odd that the same treatment could help the opposite symptoms as such? Yes, hypo and hyper are different, but you still have to support the same organs in the endocrine system to bring the body back into balance. For example, two people can both have blood sugar imbalance and adrenal fatigue, but one can present with hyperthyroid and another with hypothyroid because they are each biochemically individual. But, they would both need to reduce their sugar intake and take steps to heal their adrenals to bring their body back into balance. I just recently got my 23andme report and would like to know who interpreted your results. I live in southern CA so I could probably see the same doctor. Thanks for your great list of resources. Wow, so many great tips! And even everyone can benefit from most of these for sure. Thank you! I become extremely weak and unable to fight off any illness about 2 weeks after I begin a walking routine. I have always enjoyed walking until I realized the cycle of getting sick about week 2 just from walking 1.5 miles a day. Also, I have attempted to consume sauerkraut and other fermented foods that make me painfully sick. Any suggestions? I feel my attempts to overcome thyroid issues are senseless and that I cannot feel better. I am gluten free, watch my sugar and dairy intake but it seems exercise and probiotics are not for me. I'm sorry to hear about your health issues. I've heard that some people have to heal the gut for quite a while before they can introduce probiotics/fermented foods. I had to eat a completely clean diet to heal my gut for 9 months until my hives went away and we started to see a glimmer of hope. These things take a lot of time and patience. Don't give up! :) You might want to look into the gaps diet: www.deliciouslyorganic.net/the-gaps-dietI completely understand about the walking. I experienced the same type of thing and had to reduce my exercise in order to give my body time to heal. It went against everything I "thought" I knew, but in the end, it was the right thing for my body at the time.Also, working with a holistic practitioner who can help you find the root cause of your disease can be incredibly helpful. I had a goiter after giving birth and three years later (following a miscarriag) my health really began to go downhill starting with depression and weight gain continuing with all the normal hypothyroid symptoms. Following a protocol like yours I have been able to mostly recover but my brain fog and memory is still lacking. Suggestions? I'm glad to hear you are feeling better following a nutrient-dense diet. If you have brain fog/memory issues, it could be that your thyroid is still working a bit too slowly. Even if your labs are in the "normal" range, it could be that it's too low for you personally. I would keep with your diet, and talk with your practitioner about your symptoms and see if you can figure out a way to help the thyroid to rev up a bit. Also, you might want to check your cortisol/adrenal levels. Sluggish adrenals can also contribute to brain fog. A saliva test is a great place to start! Are grains something you plan to give up for life or do you think once you have reversed the disease for awhile, whole grains could be reintroduced in small amounts? I've already started cutting out processed foods and buying organic but giving up all grains will be the hardest thing for me! Wow! I must say this is an excellent post. You covered so much and I am sure this took a long time to put together. Great job. This will be helpful to so many! Thank you. Thank you so very much for compiling this list. So many helpful ideas to follow up on! I love all the info and help that we can get from kind people like you. I suffered for years with Hashimoto's and slowly and getting a bit better, but I had to practically diagnose myself. My issue now is many of the suggestions of what to do to help (i.e. certain vitamins, cod liver oil etc ) that are recommended are literally 2-3 times more expensive than most out there. Honestly I can't afford it. And please don't tell me that I can't afford the health bills if I don't do it. When one only makes 30K a year for two we are thankful we can afford the one car we have and to buy clothes at Target once in awhile. Forget finding a certified nutritionist, functional medicine doctor, naturalpath etc. I just plain can't afford it. Does this mean I can't get the care and healing that others can afford? Holistic practitioners are unfortunately not covered under most insurance providers (this is mainly because the government doesn't believe these practitioners are as important as medical doctors). I still think you can find the help you need...it just might take a bit more homework and effort on your part. Would it be possible to find a D.O. that is covered under your health insurance? They often look at things from a more holistic perspective. Or, maybe find a Nutritional Therapy Practitioner who has a newer practice and doesn't charge quite as much (they often do Skype sessions with clients if they aren't in your area). A 30 minute consult could be worth the $30-$40 and give you the tools and information you need to get going on the right path.Instead of supplements, maybe do your best to purchase the most nutrient-dense foods you can. Beef Bones and chicken backs/necks are usually sold at the butcher counter for very cheap (you have to ask them b/c they don't usually put them out on display....for obvious reasons...haha!) You could use these bones to make bone broth/soups/stews and then also eat the marrow from the beef bones. Organ meats are also very inexpensive and some of the most nutrient-dense foods on the planet! These meats could help aid in your recovery. Purchasing eggs and other meats direct from a local farmer can also help cut costs. I would try to focus on purchasing super nutrient-dense foods, getting plenty of rest, sunshine, keeping stress levels down and doing easy at-home detox therapies such as castor oil packs, epsom salt baths, oil pulling, etc. (I mention many of them in this post and are very affordable). This is just my opinion, but that's what I would do! :) I hope that helps! Felicia- some naturopathic doctors will work with you on payments. That has been my experience anyway. I had to do quite a bit of research and "interviews" to find the right one. I totally understand the expense. Diet can make a huge difference if you can't afford the supplements all the time. There are wonderful natural doctors out there who want to heal and will work with you. I just found out 3 weeks ago I have hypothyroid, I am really, really struggling. i do not know where to begin. Seems like I will have a good day and then it goes downhill. i am constantly tired and no matter what I eat, I either swell up, fingers, calves and feet and get bloated and short of breath. i am at my wits end. Any suggestions??? I'm so sorry to hear of your health issues, Barbara. I'm not a practitioner, but I went through a similar situation a while back. If you're swelling and having zero energy, you could be experiencing adrenal fatigue. I had this happen and no matter what I ate, or how much I exercised I was exhausted and swelling. According to Dr. Christensen - The adrenals and thyroid are directly connected, and even if your thyroid is working perfectly, if the adrenals aren't putting out the correct amount of cortisol, your thyroid can suffer (and you can be hypothyroid and TSH can be elevated). It's possible that your root cause of thyroid issues is adrenal fatigue. It's worth looking into!Have you had your adrenal/cortisol levels tested? A saliva test can best tell you what your levels are.I highly recommend the book "The Adrenal Reset" by Dr. Christensen. I read it a few weeks ago and it's got some fantastic info and some practical steps to get your adrenals back on track --> http://amzn.to/1zlMVQOAlso, you might consider doing a phone consult or Skype session with a nutritional therapy practitioner at my nutritionist's office - www.biodynamicwellness.com - They can also order a saliva test for you if needed. I hope that helps. Hang in there!! Are you using pure salt, not iodized? Preferably a sea salt, like Real Salt (which is actually from an ancient sea, and is mined). I reacted to salt initially, and then figured out I was ingesting iodized salt, which has dextrose in it - corn. Once I eliminated that, I started to get better. Also, some people will react or not react to salts from different areas. Good luck, and hang in there. I was curious to know if you have looked at tumeric? I've read a few articles about it, but don't have any personal experience. Hi ,thank for great information provided above! . It helped me a lot to understand my Hashimoto right now. But I have one question : do we need to take Selenium supplements as well ? I ordered your cook books because I need to go grain free. I'm already caffeine, sugar, dairy, gluten free. Do your recipes contain sugar?Thank you for this information! I was just diagnosed even though I've been battling these awful symptoms for years. I did almost all of the things on the above list, from switching to a GAPS diet and then eventually a straight Weston Price/Pottenger style diet all the way to the genetics and methylation stuff. And I finally found my root cause, too. My root cause turned out to be biotoxin illness, also called Chronic Inflammatory Response Syndrome (CIRS). I also have been on a treatment for biotoxin illness, called the Shoemaker Protocol.Long story short, the above steps really can work. After 15 years of thyroid supplementation, I've now been totally off it for a year and a half. I hope this gives others hope. I remember being told even by my naturopath that I'd probably never be able to stop thyroid medication. But deep down, I kept some sort of faith in the healing power of the body, and I kept looking and looking and looking for answers. Good luck, all. Thank you for sharing, Kim! I'm so happy for you! Thank you, I have a question about the medication. Are you still taking a synthroid? Did your dose quadually go down during this process? I was diagnosed with hypothyroid after having my son. After finding out I was pregnant again with my daughter I was diagnosed with Hashimoto. She is now 7 years old and I feel tired all the time, my joints are sore and edema in my legs. Doctor just look at TSH is normal. My sister just found out she has hypothyroid, but not Hashimoto, her legs from the medication get swollen with water. If she goes of the synthroid she does not have this. I just wanted to know if you are off the medication? Iodine is a good supplement to take. For some it can cause antibodies to increase, so it's good to talk to your holistic practitioner to see if it's a good supplement for you. Thank you for the kind words! I'm so glad that you found the information helpful. Omega-3's are also found in grass fed and organic meats, organic cultured butter, ghee, liver, organic eggs, and pastured organic dairy. You can get plenty of omega-3's from these foods. I found out I have Hashimoto. I am working with a nautrual path. I also know I have mhfthr methyaltion gene disorder and positive ANA blood test for lupus. What do you take for the MHFthR gen e mutation. My naturepath put me on porcine thryroid medication and bioidentical sublingual progesterone. I go back and forth about weather i should take the meds or if just doing diet would be enough. Will taking the meds actually make the thyroid stop working? This all seems so overwhelming. I had an amalgam filling removed this summer....what is the improper way to remove it? I know alot of questions. I just want to get well. I've heard that Synthroid can be detrimental to the thyroid in the long-term if you're looking to try to eventually regenerate the tissues. Everyone is different, so it's hard to say which supplements would work best for your particular MTHFR mutation. The ladies at www.biodynamicwellness.com are well-educated on how to help those with MTHFR mutations. I'd give them a call and see what they recommend. I'm really curious about the genetic testing and mthfr gene mutations. Can you tell me what types of supplements your nutritionist advised you to take for your specific mutations? Just wondering what nutrients might be related. Also, I see a lot about the AIP diet, but from looking at your website, you seem to be an advocate for only grain and sugar free. Is that the extent of your diet for recovering from your autoimmune disease or did you at some point cut out dairy, eggs, legumes, nightshades, nuts/seeds, etc.? Last question :-), did you at any point have an IgG food sensitivity test done? I know they are controversial, but my doctor is encouraging me to do it. Sorry for so many questions, but you are my hero and I just really want to know more about what I can be doing to heal! Thank you!! So after you found out you had Hashimoto's and cleaned up your diet a bit and began taking supplements, eventually your food sensitivities went away or do you still react to certain foods? I feel like my body is reacting to a LOT with eczema and nasal issues that I didn't have in the past. I just don't know if I should be trying to pinpoint and remove every single thing, or just generally change my diet and hope the sensitivities resolve on their own. My antibodies have already decreased some just from cutting out gluten and sugar so I'm still hopeful that I can continue to see improvements through diet changes! Thanks for all the information it was helpful cause I didn't know some of the things you said in your 50 Tips & Resources to help reserve Thyroid Disease . I do have other disabilities & try to teach these others . Thank you for this list. I have hyperthyroidism and I want to start taking fermented cod liver oil but worried that the iodine in the FCLO. Do you know if there is very much iodine in fermented cod liver oil and is it ok for hyperthoid as opposed to hypothyroid? I've never heard of the iodine in fermented cod liver oil being harmful for those with thyroid disease. I do know that some people do well on iodine supplements and some don't, but when it's in cod liver oil, it's in it's bioavailable form, so I think it would be ok.
May I add one more piece of advice that comes from TCM (Traditional Chinese Medicine): cover your neck with a scarf when the weather if cool and windy. Amalgam filling are actually 50% mercury, so these are the ones that are "mercury" fillings.